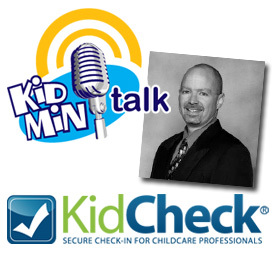 I recently caught up with KidCheck CEO Alex Smith and interviewed him on my podcast, Kidmin Talk. Let me encourage you to invest just a few minutes to give a listen. WHY is this worth your time? If you are in children’s ministry leadership, one of the areas of responsibility you inherited, that you may not have counted on when you got your Call to Ministry – was the safety of the kids you oversee. No. No one has ever said that to me. And yet I have had leaders tell me that had no idea they’d have to worry about separated parents with restraining orders picking up their kids. Liability for custody issues concerns them! We got into this business because we wanted to introduce kids to Jesus, creatively teach the Bible and partner with parents in discipling kids, right? But we find ourselves responsible for some other pretty serious stuff. How do we manage all this SECURITY STUFF that we admit is important, and we might feel a little guilty that we kinda hate it, but we know gotta do it? Enter KidCheck! Listen to my podcast and find out how modern technology has taken so much of the work away from you, delegated it to parents, and has become easier and incredibly affordable – and just plain cool too! PLUS, Kidology Members save on the cost of KidCheck’s services! Addicted to Speed? The Cure has been discovered!